A television (also TV, telly or tube) is a machine with a screen. Televisions receive broadcast signals and turn them into pictures and sound. The word "television" comes from the words tele (Greek for far away) and vision (seeing). Sometimes a TV can look like a box. Older TVs had large wooden frames and sat on the floor like furniture. Newer TVs are much lighter and flatter. A television can show pictures from many places. Computers and mobile devices also can be used for watching televsion programs. At first, all televisions used an antenna (or aerial). This would pick up Television programmes from broadcast stations. A TV station could be many miles or kilometers away, and still be received. TVs can also show movies from VCD and DVD players or VCRs. Cable TV and Satellite television can provide more programs at once than broadcast can. Video game consoles connect to most modern TVs. Some computers can also use a TV as a monitor. All TVs have screens where the picture is viewed. 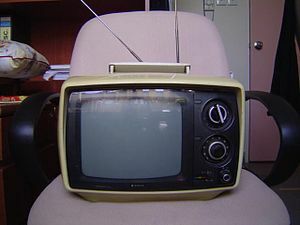 Before the 1920s these were usually "black and white", which made everything look grey, but all modern TVs show colors. Screens also used to have rounded corners, but now they are usually flat rectangles with straight edges. It is a wider rectangle that looks more like the shape of a movie theatre screen. This is called widescreen. If a widescreen set was 30 cm tall, it would be 53 cm wide. For this to work best, TV shows also need to be made in widescreen. Widescreen sets can still be any size, but they have the same widescreen shape. Until the late 20th century, television screens were cathode ray tubes. These are like heavy glass jars with one side bulging out to form the screen. Today there are also Liquid crystal display (LCD), Plasma, projection, and organic light-emitting diode (OLED) TVs. Research shows that watching TV adds unsocial behaviour especially when children are watching TV. This page was last changed on 3 December 2014, at 11:32.